The Bulk Domain Search allows to find email addresses starting from a list of domains or company names. To get started simply go to the Bulk section of your account. Email address: the email address found from Hunter. Domain name: the domain associated with an email address. Organization: the company name extracted from the domain. Type: an email can be personal or generic. 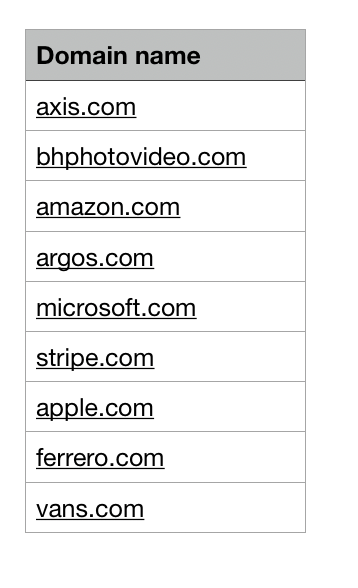 Sources: the number of sources where you can find that email address. Pattern: the pattern used for that email address. Set a maximum number of email addresses p/domain or company name: enter the maximum amount of email addresses you want to get for a single domain. Choose if you want to only get Generic, Personal email addresses or both. Select the department you want to find email addresses for. 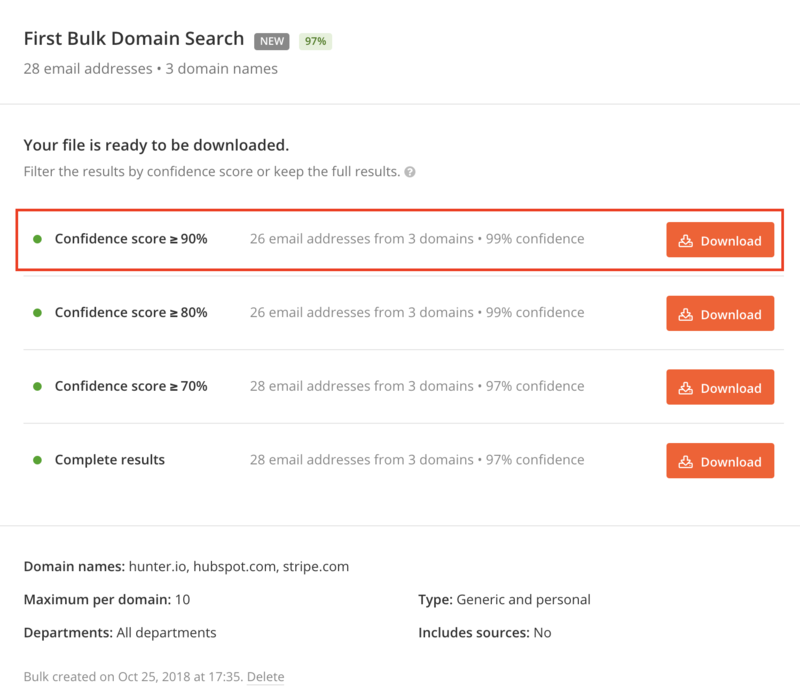 When downloading the resulted file you can filter the emails by confidence score and choose a specific range of emails based on your needs. Emails with a higher confidence score have more chances to be deliverable. 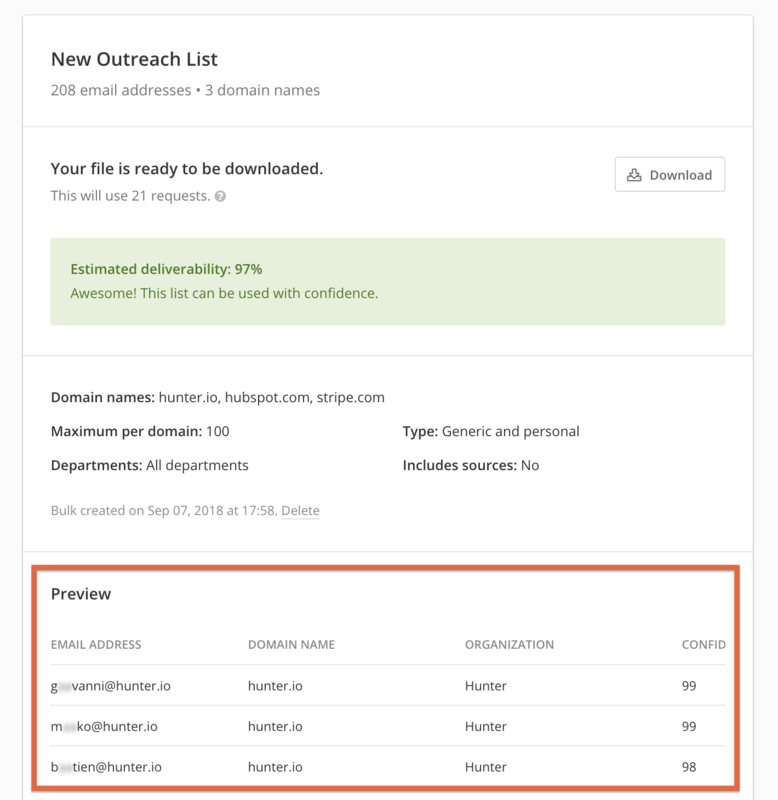 Emails resulted from the Bulk Domain Search can now be imported as Leads and saved in a dedicated list of leads so you can later edit or use them for your Outreach email campaigns. After processing a Bulk Domain Search simply click the "Import as leads" button and follow the guided process. The Bulk Domain Search functionality can be used by Premium Accounts only. By uploading a CSV file. By copying and pasting a list of domains or company names. The number of email addresses returned. The number of domains analyzed. The number of request this search is requiring. If using company names make sure to use the correct format for them: you will need to remove additional characters such as LLC, brackets, slashes, that are not allowing Hunter to extract the correct company name. A good company name is "Company" and not "Company Ltd". You will see an error message in case your plan hasn’t enough available request to perform the task. The list of email addresses of a Bulk Domain Search can be downloaded multiple times. Only the first download needs requests to be performed.